House Tax Plan Is Little Help To High-Tax States Like New Jersey Being able to deduct local income and property taxes, evens things out — but the House Republican plan in the works eliminates most of those reductions, meaning no tax savings. 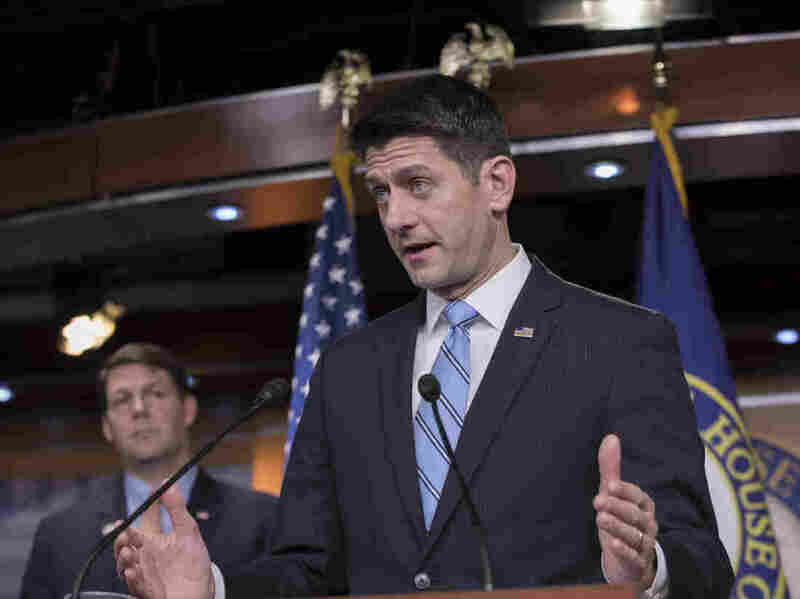 Speaker of the House Paul Ryan, R-Wis., joined at left by Rep. Jodey Arrington, R-Texas, on Nov. 7 on Capitol Hill in Washington defends the GOP tax reform plan being crafted in the Ways and Means Committee. Northern New Jersey is one of the highest-taxed places in the country. So a tax cut sounds great to a lot of people there. But the House Republican plan being debated this week may actually raise the taxes of many people in the region. "I was hoping they would give us more things to deduct on our tax returns, honestly," says Kassie Smith, a resident of Westfield, New Jersey. Smith is a bookkeeper and her husband is an auto mechanic. They pay nearly $12,000 a year in property taxes. Living near New York City pushes incomes higher, even for blue collar workers, and puts them in a higher tax bracket. Being able to deduct local income and property taxes, evens things out. But the current House Republican plan currently eliminates most of those reductions, meaning no tax savings. In fact, the Smiths worry their tax bill could go up. "I'm not going to tell my boss, 'Oh, my taxes went up $600 this year, you need to give me $600 more in pay," Smith says. An analysis by the Tax Policy Center, a research group, suggests that while most Americans will see a tax cut, almost 10 percent of middle-class workers will see an immediate tax increase of more than $1,000. But the Smiths and others in high-cost states like New Jersey, Connecticut, Massachusetts or Virginia could see higher increases. Some think that might be a good thing. "Other states would say we have too much government here in New Jersey," says Walter Leurs, board member of the New Jersey Taxpayers Association, which has been pushing to lower property taxes in New Jersey. Some who support the current House GOP plan argue that losing these deductions might just finally push local tax rates down. Also, others wonder why taxpayers in Wichita should subsidize public pensions in New Jersey. "Someone from say Oklahoma or Texas or Kansas would say, 'Look your property taxes are much higher,'" Leurs says. "You have a higher level of service, so you're kind of getting what you pay for over there." This is exactly what worries left-leaning groups fearing that without these deductions, voters will revolt against local taxes, depriving local governments of resources. "It would be one thing if they were taking away this deduction and ramping up investments that were going to come to state and local governments, but they're taking away this deduction and cutting taxes, by and large, for the wealthiest Americans and for large corporations," says Jon Whiten, vice president of the New Jersey Policy Perspective. Under his analysis of the House Republican plan, the country's top 5 percent would net more than 60 percent of the tax cuts. However, another research group, the Tax Foundation, says that cutting the corporate tax rate will eventually increase GDP growth, boost stock prices, and create almost a million new jobs.